Place online orders directly form our website. The name M? 'ida is pronounced Maaida and simply means a table spread of food, dining table or banquet. M? 'idah is amongst the North East’s most fashionable and contemporary British Indian restaurants, regularly rated 5 stars by respected lifestyle and food magazines. It has been elegantly furbished to provide our customers with a fresh ambience and a premiere chic Indian dining experience with a twist. 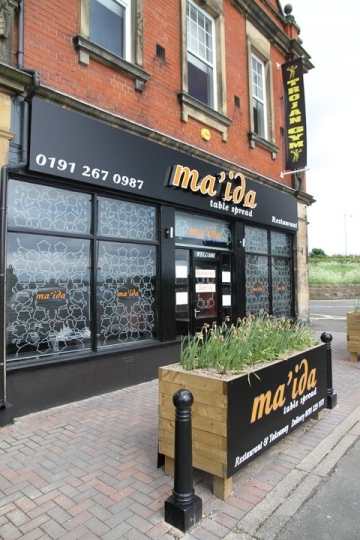 At Ma'ida we have been inspired by the food our families love and enjoy and our passion is to bring the same traditional homely cooking to our customers. Our menu truly represents the cuisine of the Indian subcontinent, with great emphasis placed on sourcing the freshest ingredients. All dishes represent distinct cooking styles of the different regions of South Asia and are not a permutation of a generic base sauce, a method which has become common place for British Indian Restaurants. Do not hesitate to specify your preferred level of spice and if there is anything you would like to alter when placing an order. Any dish which does not appear on the menu can be prepared on request or cooked specifically to your taste. Some dishes may contain traces of nut, so please be careful with your selection and inform the management of any known allergies. We greatly value your feedback, so please let us know if there is anything you believe may be improved.